Are There Really Irreconcilable Differences? SPECIAL NOTE: If you haven’t yet checked out the Love Your Life Summit, there is still time. Every day until June 20 you will be able to watch an interview with Marci Shimoff and two people who give excellent advice on bringing joy and love into your life. How can you move beyond what seem to be insurmountable differences of opinion and outlook? Barry and Joyce Vissell are two of my favorite counselors on marriage and partnerships. They bring a wealth of experience from 37 years of working with couples and from their experience as a doctor and a nurse. They’ve given me permission to reprint articles from their SharedHeart Newsletter. Their latest newsletter arrived last week with the following commentary about differences. It expresses one reason why my husband and I have been married for more than 50 years: we’ve not let our differences, of which there are many, interfere with our commitment to love and honor one another. In a court of law, if both partners of a married couple claim they have irreconcilable differences, the court will grant them a legal divorce – without even asking what the differences are! Joyce and I, on the other hand, having worked with thousands of couples over the last 37 years, challenge that there is no such thing as irreconcilable differences. We have seen that ANY difference can be not only tolerated, but even appreciated. But that takes real understanding and a commitment to love. So what constitutes grounds for separation or divorce? It’s not the differences themselves. You will end up separating or divorcing if you choose not to try to understand them. Your relationship will end if you choose not to look inside to better understand yourself, as well as your partner. Differences are not the problem. Secrecy, cruelty, active addictions and infidelity are hurtful and can be grounds for divorce if either partner refuses to get help. When you’re in love, you easily understand how opposites attract. The differences in your lover don’t bother you. Their messiness or neatness, their introversion or extraversion, their love of the outdoors or their love of the indoors, their raw food vegan or steak and potatoes diet, these don’t seem to detract from the love you experience together. They may even be “cute” to you. It is only later, after the honeymoon glow has faded, and each of your egos and personalities have powerfully come on the scene, that differences get magnified and can grate on you. The question then is: How do you solve the problem of differences? One thing is for sure. It will never work to try to change your partner! Sure, you may correct bad habits. Early in our marriage, Joyce took a firm stand against my messiness. Just because I never used a vacuum cleaner in the first 22 years of my life, it simply wasn’t acceptable to her at the time that I didn’t help her clean the apartment. Did I change? Yes. Sometimes she laughs at how fastidious I can now be. On a more serious note, I have had difficulty with Joyce’s sensitivity. Sometimes I’ll give her what seems to me a small correction, and she’ll feel criticized and hurt. I remember one time, long ago, when I complained about her sensitivity. She said to me, “Barry, you could have married a man who is just like you.” Her point was well taken. Now I am deeply grateful for her sensitivity. Perhaps more than anything else, her sensitivity has caused me to develop my own sensitivity. Our religious difference – me being raised Jewish and Joyce Protestant – nearly destroyed our relationship in our early years. We tried to change one another. We had many arguments about religion. After two years, we deliberately transferred to different colleges to get away from each other. We tried dating persons of our same religion. It just wasn’t working. All the differences were only in our minds. In our hearts, there was a love big enough to embrace all our differences. Finally we decided to get married. My childhood Rabbi was extremely discouraging. Joyce’s minister, Reverend Davis, agreed to marry us on one condition. He said, “I will only marry you if you promise never to try to change each other. It is the differences between you that will help you to most grow.” In a way, he was our first spiritual teacher, giving advice that has helped us to this day. Our early marriage was still not easy. Although we understood about not changing each other, religion was still a difference we were trying to tolerate. What really helped was a deeply soulful search for a spirituality that we could share. 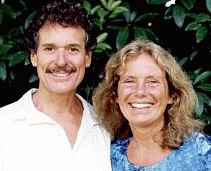 We started with Transcendental Meditation, Hatha Yoga, Sufi Dancing, and Ram Dass’ book, Be Here Now, traveled the world in search of spiritual teachers, and studied a wide variety of spiritual paths, including the roots and origins of Judaism and Christianity. We searched for, and found, spiritual similarities that we shared, practices we could do together. Our favorite at the moment is very simple: we touch our foreheads together and take turns speaking a prayer from the heart – an expression of gratitude, asking for ways to be of service on this planet, as well as asking for help with current challenges. Yes, Joyce and I have our own spirituality, our own practices. Is one method better than the other? Absolutely not. If it brings inner joy, peace, and respect for all life, it doesn’t matter what the practice. Yet as a couple, we make it a priority to share sacred moments, whether it is the praying together, sitting side by side meditating in silence, appreciating one another, practicing sacred sexuality, or celebrating the beauty of nature. It really doesn’t matter how different two people are if: one, those differences are respected and two, the similarities are found and celebrated. Over the years we have observed that couples must have or create a common link, a unifying quality, something that is deeply shared. If the deeper focus is on what you have in common, your differences become background, and thus are more easily embraced and loved. If you focus on your unity, your diversity will challenge you to grow. Celebrate your similarities, and you will learn to celebrate your differences. I Leave a Heavy Footprint. How About You? What an inspiring post! It is sound advice and I hope I’ll be able to follow it and have as long a relationship as you do. I agree that the only irreconcilable differences are the ones you yourself decide cannot be reconciled. Irreconcilable differences is commonly heard these days especially among celebrities who are getting a divorce. This is an inspiring post that couples, celebrity or not, should read and take to heart because relationships are very disposable these days and that’s a sad thing. This is a response to both Cornelia and Counseling Atlanta (missed replying to Cornelia when I was out this past summer). As I have written in another post, my husband and I are “sole-mates,” not “soul-mates.” After more than fifty years of marriage, I find that as I have become more comfortable with myself, it is easier to be more comfortable with others, even those who are very different than I am.